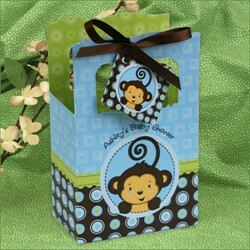 Baby shower favors are a way for the hostess to say thank you to her guests for attending her event. So why not continue the overall nursery rhyme theme you have chosen with your party favors? You can be very creative and give your guests something they will remember long after your baby shower is over. The favors don't have to be expensive. Buy in bulk to save on the costs. 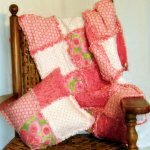 They can be store bought items that you assemble into a single item, or something totally homemade. Keep in mind the nursery rhymes you have chosen and let your creative side run wild. You'll come up with all sorts of great little ideas that will make unique baby shower favors. The fun is keeping the nursery rhyme going. One way to do that is to write out or print out little tags to tie onto the favor. These tags can have a line of verse from the rhyme or the title of the rhyme. You can even set your favors around as part of your shower decorations. Check out this list for some great little baby shower ideas. Baby shower favors can even double as part of your shower decorations. Nursery Rhyme Baby Shower Invitations - great ideas to create nursery rhyme themed invitations! Nursery Rhyme Baby Shower Menu - you'll find lots of great rhyme food ideas! Nursery Rhyme Baby Shower Decorations - great ideas to bring those nursery rhymes to life! Nursery Rhyme Baby Shower Games - fun activities for your shower guests! Nursery Rhyme Baby Shower Party Favors - great ideas for your guests to remember your special party! Nursery Rhyme Baby Gifts - wonderful themed baby presents! 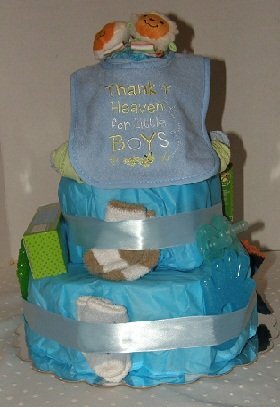 Diaper Cakes - great centerpiece and gift all in one! What creative baby shower favors have you made? We would love to know how you used your favorite nursery rhymes. We're sure you have lots of wonderful, delightful ideas to share with us. So please send us your ideas with pictures if you have them!